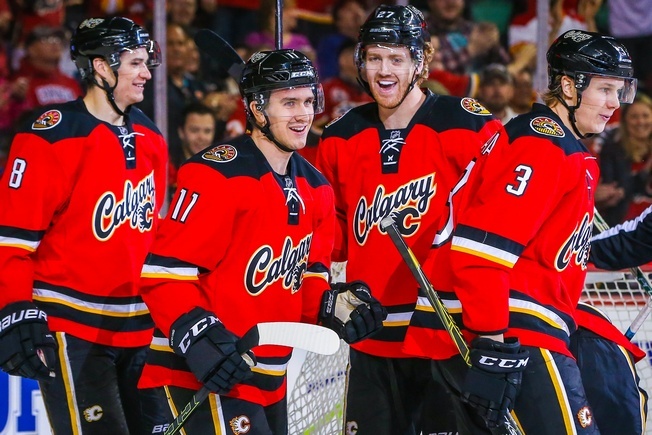 Like all Canadian teams last season, the Calgary Flames ended things on an unacceptable note. They finished 35-40-7, 10 points behind the Minnesota Wild for the second wild card spot in the Western Conference. As a result, the Flames canned head coach Bob Hartley in May and brought in Greg Gulutzan. Calgary has its work cut out. Their penalty kill was last overall last season and their power play was 22nd overall at 17 percent. The goal for the immediate future is to increase the speed and rush capability of the franchise, with an emphasis on goaltending that began with the acquisitions of Brian Elliott and Chad Johnson. The Flames finished with an NHL-worst .898 save percentage last season and allowed a league-high 257 goals. They relied on four goaltenders – Jonas Hiller, Karri Ramo, Joni Ortio, and Niklas Backstrom – and couldn’t get anything going. With Elliott, who led the NHL with a .930 save percentage, Calgary receives an instant upgrade. The Flames are a young team. 23-year-old Johnny Gaudreau was good for 30 goals and a total of 78 points last season, with six goals on the fraught power play. He’s a lively skater and boasts some serious creativity, which means Calgary will turn to him for more in the 2016-2017 season. The team still has to handle his contract, but he’ll be a point-per-game producer. Sean Monahan posted 63 points, including 27 goals, and is the best centre on the team. The 21-year-old from Brampton is yet another example of Calgary’s young core. Like Gaudreau, there are some contract issues to sort out with Monahan. But like Gaudreau, the Flames will rely on Monahan to produce and put up big minutes. New acquisition Troy Brouwer makes this team better. He had 39 points last season with the St. Louis Blues, including 18 goals, and added 13 points in 20 post-season contests. The 30-year-old from Vancouver isn’t the most consistent player, but he does give the team a well-versed option up front and throws his body around. That should help Gaudreau and Monahan find more space. Centre Sam Bennett will enter his second full season in the NHL and is set to make a big jump. He had 36 points last season in 77 games and is already demonstrating leadership qualities, which should make him a long-standing member of the club. Along with 27-year-old Swedish centre Mikael Backlund, Bennett illustrates Calgary’s depth down the middle. 32-year-old Mark Giordano anchors the Flames as the elder statesman of sorts. The veteran blueliner is a smooth skater and he can score, as evidenced by a 21-goal performance last season for a total of 56 points. He had nine goals on the power play and came close to averaging 25 minutes a game. T.J. Brodie posted a career-high 45 points last season and he’s a good puck-mover. Two of his goals came on the power play and he averages over 25 minutes a game, which means he’s in position to pick up a lot of the action. But there’s a suggestion that last season was an anomaly given how more specific statistical totals – goals, penalty minutes, plus/minus – were down last season from 2014-2015. Dougie Hamilton had a dozen goals last season, five of which came on the power play. He put up nearly 20 minutes of ice time a game and has a big point shot, which opens things up on the man-advantage. Along with 24-year-old Finnish defenceman Jyrki Jokipakka, Hamilton gives the Flames some options in their own end. As mentioned, the addition of Brian Elliott is an instant upgrade in goal. The 31-year-old from Newmarket had 38 starts last season and posted a 2.07 goals against average with a .930 save percentage. Elliott covers a lot of the net and can be a deceptively quick goalie, with top-tier control of his angles. He’s also a mature keeper, even if he lacks puck-handling capabilities. Johnson, acquired after a season in Buffalo, went 22-16-4 with the Sabres and put up a .920 save percentage with a 2.36 goals against average. He can enter a game cold and weather the storm, which should come in handy in Calgary. The 30-year-old from Saskatoon gives the Flames stability and gives Elliott the opportunity to put in some serious minutes. Calgary has a good-looking prospect pool, with a deep set of goaltenders and a skilled collection of left wingers. At the top of the list is 18-year-old Matthew Tkachuk, the sixth pick of the 2016 NHL Entry Draft is handy around the front of the net and can be a gutsy player. There are some known issues with his defensive game and his skating could use some work. The Flames acquired winger Hunter Shinkaruk in a trade with Vancouver. The 21-year-old is ready to break the lineup, as he features sublime playmaking ability and can put the puck in the net. He’s not a sizable player, though, and he could use more bulk to play in the big leagues on a permanent basis. The Flames are an exciting young team with a lot of speed and skill, but they’ll have to find a way to put the pieces together to become a formidable hockey team. The addition of Brouwer should help, while the addition of Elliott will definitely help. Having a goaltender to count on is a big first step and should free Calgary up for some much-needed creativity.